Predator is a 1987 science fiction flavoured action movie starring Arnold Schwarzenegger as the muscular hero fighting an evil alien creature. 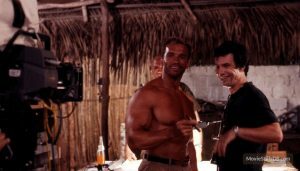 Director John McTiernan later on directed the classic action movie Die Hard with Bruce Willis and the less successful Last Action Hero which also featured Arnold the Austrian Oak. 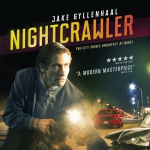 The screenplay was written by the unknown brothers Jim and John Thomas who also wrote the Predator sequels and spinoffs. The movie starts with the image of an alien aircraft flying towards earth, with no further explanation. The next half hour of the film however does not include any scifi but develops as a classic action movie. 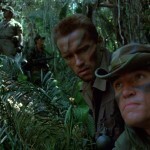 Arnie plays a green beret named Dutch with a German accent as thick as his biceps. Together with Dillon, his old friend from the CIA and four other army dudes he departs on a mission in the South American jungle. In the jungle, the mighty jungle, Dutch and his pals discover the skinned corpses of some colleagues. Bound for revenge the six men pay a visit to a guerilla village. In five minutes of terrific action shots, nearly all guerilla warriors are killed and their base is destroyed. Schwarzenegger uses every opportunity to shoot one liners at his opponents. After pinning a guy to a pole with his knife he smirks “Stick around!” As he kicks in a door, he says “Knock, knock” in his typical deadpan way. The troops are left with a female hostage. The devastation of the pueblo brings them much joy but also leaves them with a female hostage who tries to escape them on every occasion. Why they kill every single guerilla but decide to save her life and prevent her from escaping is never explained. One of the guys is Billy, a native American played by Sonny Landham with a highly developed sense of smell. He senses that the skinned men they found earlier weren’t slaughtered by the guerillas but by something different. Hawkins, a nerdy private who likes to crack coarse jokes and wear large glasses suddenly disappears. Anna, the hostage played by Elpidia Carrillo is the only witness and is in shock. A trail of blood leads to his skinned body hanging in the trees, but the soldiers fail to notice this. Anna claims she saw the jungle come to life and take Hawkins away but of course no one believes her. 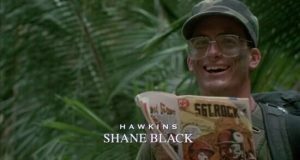 Shane Black, who played the character of Hawkins, is actually a writer and given his small role he had time to continue his writing on the screenplay for Lethal Weapon and The Last Boy Scout. 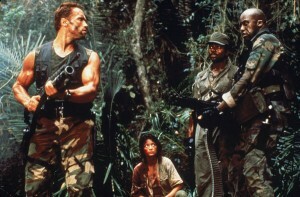 The soldiers use all their firepower in an attempt to kill the predator. 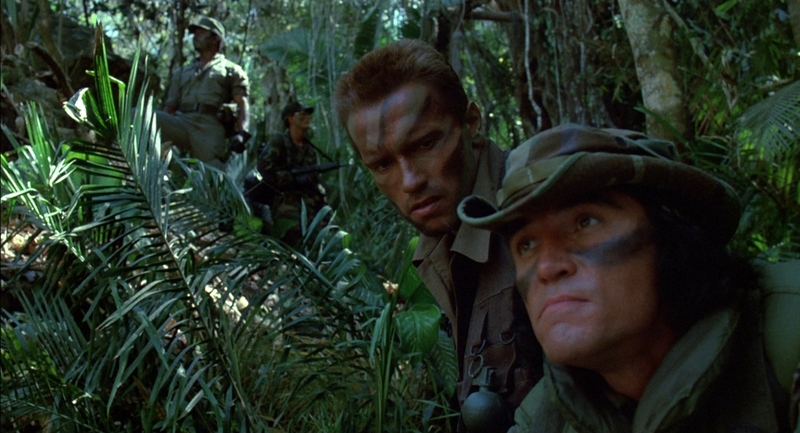 When another soldier is brutally murdered by the invisible predator, the men use all their firepower to blast the jungle to pieces, but can’t find a corpse. However, Anna notices some fluorescent, glow in the dark like, alien blood on the leaves of a plant. ‘If it bleeds it can be killed’ is Dutch his logical conclusion. Who or what is this invisible killing machine? The invisible chameleon like creature was initially played by kickboxing hero Jean-Claude Van Damme but he was not entirely happy with his anonymous role. Therefore another actor was found to play the predator. 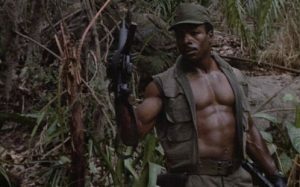 Kevin Peter Hall was much taller than JCVD and even taller than Schwarzenegger and Carl Weathers, who plays the part of Dillon. The sound the predator makes could be compared to a door in desperate need for some oil that is slowly opened. The soundtrack for the film is a nice traditional score combined with jungle sounds by Alan Silvestri, known for Back To The Future, Forrest Gump and many other Robert Zemeckis films. 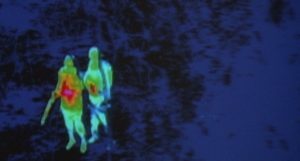 The alien predator has some kind of thermal view and infrared vision and several cool scenes in the film are shot from the hunter’s perspective. He or it rather can also see the booby traps which the commandos have set up. 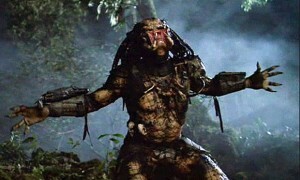 The predator only attacks people who are armed so it must have a way to see guns and knifes too. Why he left the guerilla warriors living nearby alone is never explained. 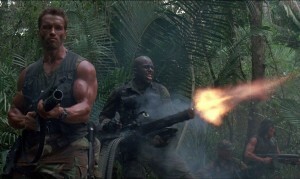 In the end Arnold and Anna are the sole survivors and he orders her to “Get to tha choppaaa!” in this classic quote. 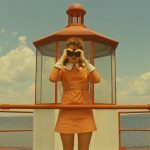 Without a map, and without any protection she miraculously manages to find the helicopter. As we see her fly off, the attentive viewer notices the pilot is played by the same actor as the predator. The predator is tired of being invisible and removes his helmet. Dutch is able to escape by jumping into the water. Upon arriving at the shore, covered in mud he notices the predator can’t see him. Now he’s invisible the roles are reversed and Dutch makes a trap. In doing so he uses several knifes although he didn’t bring any along since he arrived unarmed and without a backpack. In a final battle, Dutch lures the predator towards him and using his trap, he drops a trunk of a tree on the alien’s body. As one can expect, the fight is not over yet. The alien goes into self destruct mode and start laughing out loud. Our hero notices this and runs away as the predator explodes into pieces. 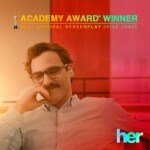 The concept of the film started out as a joke. After several Rocky movies in which Sylvester Stallone had beaten every champion on earth, the running joke in Hollywood was Rocky Balboa was going to fight E.T. 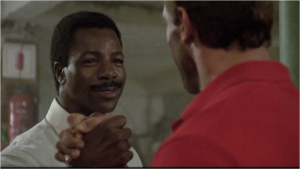 Perhaps this is the reason they chose Carl Weathers, who plays Balboa’s opponent Apollo Creed in Rocky to play the part of Dillon in Predator. Although Predator looks more like John Rambo fighting the alien from Ridley Scott‘s Alien, the movie can also be compared to The Terminator by James Cameron. This time around however, Arnold Schwarzenegger’s character is targeted for termination by an almost unstoppable creature. The way Arnie kills the predator, by luring it into a trap is also similar to how Sarah Connor kills the T-100 in the steel factory. Although the story of McTiernan’s Predator is not very sound, and the special effects and the predator’s suit look dated, the movie can still entertain an audience. 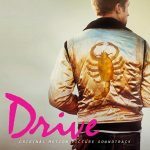 The action, the horror and the humor in the film are typical for the eighties and don’t really stand the test of time very well.